Mitsubishi Materials is proud to announce Single Sided inserts in grades MC6025 & US735. 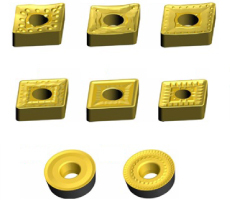 MC6025 provides both toughness and wear resistance in ISO P20 class applications. MC6025's Ultra thick Nano-texture layer of Al2O3 provides outstanding wear resistance. US735 provides toughness and edge sharpness for ISO M class applications. US735 features a Ti compound coating ideal for machining demanding applications in a variety of stainless steels. MC6025 is intended for applications in ISO P class materials such as carbon and alloy steel. US735 is intended for applications in ISO M class materials such as stainless steels. In single sided insert configurations; both grades will provide extreme toughness in interrupted cutting. MC6025's resistance to cracking and fracturing is improved; results of a thickened substrate tough layer. When combined with proven single sided chip breakers, reliable machining in interrupted conditions is achieved. US735 availability in single sided chip breakers provides reliable machining of stainless steels in interrupted machining conditions.